Last month, I wrote about how “August “the wood duck came into rehab because she was injured, caught in fishing line on the Roanoke River. Now that August had successfully “grown up” I took her to RVBC member Carol Whiteside’s home to be released back into the wild in her pond. Carol had seen wood ducks there before. In fact there was a mother woodie and her family already there. This is the rest of the story of August’s adventures and her attempt at making new friends, narrated through Carol’s emails. It is nice to see that rehabbing injured wild birds does give them a second chance at life. So here is what happened…enjoy! Carol Whiteside with August in her crate and about to be released. 8/7/16 – Later today August made a friend! Two wood ducks flew in and as one flew out. August also took flight to follow across the pond but stopped before gaining altitude. 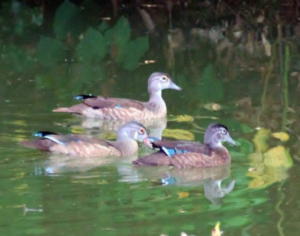 The other duck stayed and they became friends swimming around the pond side by side. 8/8/16 – August and her friend were out and about early this morning. It’s become quite comical to see Mom still a little worried about August, but pays no attention to her friend. 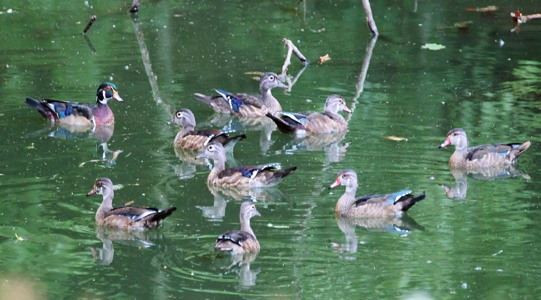 So, August leads the party of seven – Mom, five ducklings, and her friend all around the pond. Very often August mingles among the ducklings until Mom puts an end to the fun and they all follow the leader, August, who is motivated by Mom to keep moving. At times they disappear, I assume into the bushes on the ridge for R&R. Today was a great duck day being over-cast and drizzly; they were all over the pond having a great time with August confidentially leading the way! 8/12/16 – Today, we witnessed August crossing our dam; she had been to the overflow creek or perhaps to the smaller pond below ours, all by herself! Her confidence and maturity is remarkable. Since wood ducks are quite shy and reclusive, I feel fortunate to observe these episodes from the comfort of our porch, being such a short distance from our pond. 8/14/16 – Today there were no visiting ducks, just Mom and her five ducklings, so August developed a game. She purposely swims with the ducklings so Mom will chase her in flight. August is trying out her wings from shore to shore! As soon as Mom gets her across the pond, then August follows back into the middle of the pack. Sometimes Mom gives up and they all swim in a bunch, other times the flying game becomes like a tennis match, back and forth. They are all quite at home here and seem to have fun in all their antics. 8/22/16 – I thought August had gone, just didn’t see her for several days, although once I spotted her at the smaller pond below us having a great time by herself.